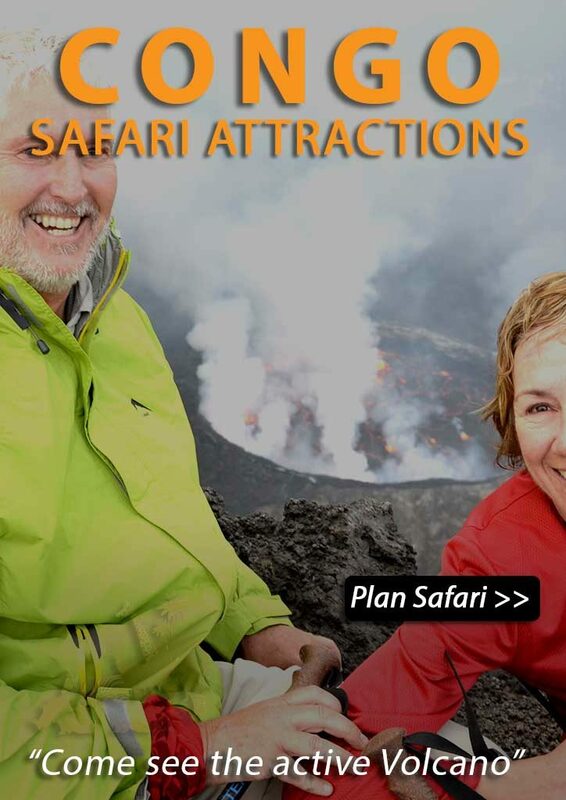 Visit some of Uganda’s most spectacular places in a comfortable way. Your accommodation for this private luxury tour is provided in some of Uganda’s very best lodges. Gorilla and chimpanzee tracking permits are included! Day 2: To Murchison Falls N.P. Today’s journey will take you north from Kampala to Murchison Falls National Park. Covering an area of over 3,840 km², Murchison Falls National Park is the largest conservation area in Uganda. The park’s name derives from its famous waterfall: the mighty Murchison Falls. The Nile River divides the park into its north and south sections. At the spectacular Murchison Falls the world’s longest river explodes violently through a narrow cleft in the Rift Valley escarpment to plunge into a frothing pool 43m below. A game drive in the park allows you to be eye-to-eye with the African animal kingdom featuring elephants, giraffes, buffaloes, lions, leopards, different species of antelope and many bird species. After lunch, you will drive three more hours to the southern side of Uganda’s largest national park, Murchison Falls N.P. You will stay at your preferred hotel. 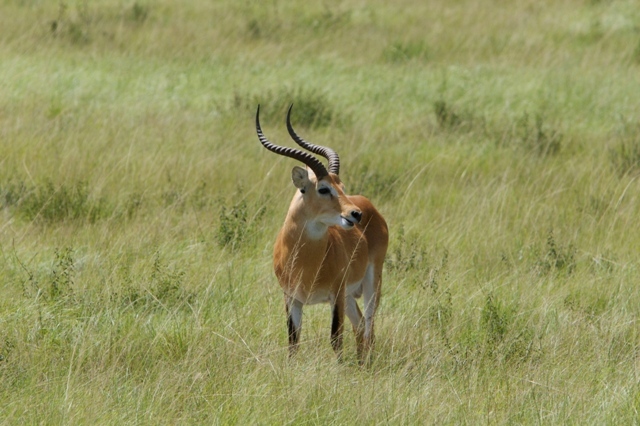 You will need to rise for breakfast and an early start on your game drive while the animals are the most active. A drive through the park brings you eye-to-eye with the African animal kingdom: elephants, giraffes, buffaloes, lions, leopards, different species of antelope and many tropical birds. They are all there! Covering an area of 3,840 km², Murchison Falls National Park is the largest conservation area in Uganda. The park’s name derives from its famous waterfall; the mighty Murchison Falls! In the afternoon you will make a private boat safari up the Nile River to Murchison Falls. Carefully watched by crocodiles, hundreds of hippos, buffaloes, water birds, monkeys and all the other thirsty wildlife that the Nile attracts, you will reach the base of the 43-meter high Falls which approaches you with a thunderous sound. Upon arriving at the base of the falls you will have the option (not inclusive) of taking a tough hike (about 50 minutes) to the top, from where you have a perfect view of the impressive falls. The Nile Delta is the area where the Victoria Nile flows into Lake Albert. A boat safari down the river towards Lake Albert is a “must do” for every birdwatcher as the banks of the delta are home to hundreds of bird species including the rare and prehistoric-looking shoebill stork. As well you will see hundreds of hippo and maybe even bathing elephant and huge crocs! In The afternoon you will make another game drive in the park. You can as well choose to relax from your lodge. At the Ziwa Rhino Sanctuary you will go – together with an experienced ranger for a safari hike to the rhinos. You will see the rhinos in a very close range! Budongo Forest is located in the southern part of Murchison Falls NP., and has the highest number of wild chimpanzees of Uganda. The habituated groups are located in Kaniyo Padibi, where you can go for chimpanzee tracking. Budongo Forest has an incredible biodiversity that – beside the chimpanzee – includes several other species like the Blue monkeys, Red-tailed monkeys, Vervet monkeys and Olive baboons. After an early breakfast, you will pick up your packed lunch and exit the park to the south. The drive is long, but incredibly scenic, passing through villages, lush green forests and hills dotted with tea plantations which characterize this part of Uganda. You will stay at a wonderful lodge of your choice, just outside the town of Fort Portal. Kibale Forest National Park boasts the highest number of primate species in the world, including our delightful cousins, the chimpanzees. Today, in Uganda, there are approximately 5,000 chimpanzees in the wild, which makes it a perfect place to spot them! An experienced forest ranger will take you chimp tracking in the morning or afternoon. En route you might also see other monkey species that live in this forest. Once located, you will spend a full hour with the chimps. Since they are wild animals we can never guarantee that you will see them. You might have to settle with hearing their hoots and hollers. At an additional fee of only $70 us dollar pp you do the chimpanzee habituation tracking instead of the regular chimpanzee tracking. This will take all day and you will be 100% sure to have a very close enounter with your closest relatives. Book this in time because only 6 persons per day are allowed to go. Your swamp walk can be postponed to the next morning. Day 7: Queen Elizabeth N.P. After breakfast you will continue your journey to Queen Elizabeth National Park. 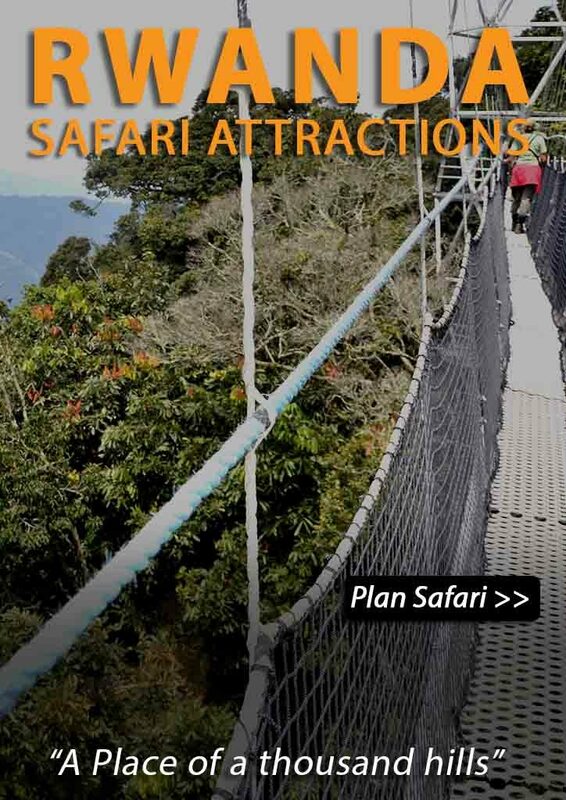 Queen Elizabeth is Uganda’s second largest park, located at the base of the majestic Rwenzori Mountain range, adjacent to Lake Edward and Lake George. In the afternoon, you will take a private boat safari along the Kazinga Channel which joins Lake George and Lake Albert. Here, you will see a lot of hippos (more than you can possibly imagine! ), as well as a variety of other animals which come to the water to drink or bathe. You can expect to see buffalo, crocodile, bathing elephant, and a range of beautiful birds. This will undoubtedly be one of the highlights of your tour. This morning you wake up early. A little before sunrise coffee, tea and donuts will be served in the lounge before we head out for a long game drive in time to see the first rays of light. You will search for all the wildlife in the park and are likely to come across Elephant, Buffalo, Lion, Waterbuck, Leopard, Uganda Kob, and many Warthogs. Instead of this activity you can as well choose to do one of the optional activities listed below. After breakfast you will proceed to the southern part of Queen Elizabeth National Park, to an area called Ishasha. If you are lucky you might spot a few during your game drive. The spectacular Kyambura Gorge, also called the “Valley of Apes”, is located in the eastern corner of Queen Elizabeth. The landscape is among the most impressive you will find in Uganda. Enter into the Gorge and you will be marveled by the verdant, rich Tropical Rain-forest right close to the Equator crossing. You can make a wonderful hike here looking for chimpanzees. Chances of seeing chimps are 50% and that is why we rather call it a nature walk. Don’t miss it; the gorge is simply amazing! To escape from the heat during the day, the lions here have learned how to climb the fig trees. If you are lucky you might spot a few during your game drive, so keep your eyes open and look up! Besides these famous lions, there is other interesting wildlife to be seen, like buffalo and the Uganda kob. 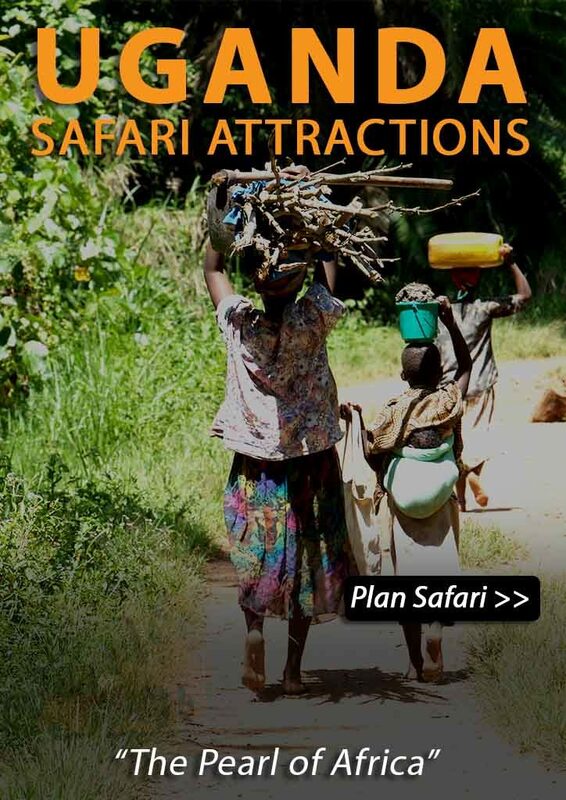 After breakfast you will game drive on your way out of the park for a last chance at spotting those tree climbing lions. Lunch will be provided at the lodge in Bwindi Impenetrable Forest; home of the Mountain Gorillas. Get a good night’s sleep at the hotel of your choice, because tomorrow you have to be fresh for the Gorilla trekking. After breakfast, you will travel to Lake Mburo National Park, one of Uganda’s smallest parks, but certainly not to be underestimated. It is the only Ugandan national park (besides to Kidepo Valley NP) which is home to zebra, eland and impala, as well as an abundance of other wildlife – not to mention the lake itself, which is teeming with hippos and crocodiles! Last but not least: The Uganda Wildlife Authority recently brought 15 giraffes from Murchison falls to lake Mburo (1st July 2015)! You can choose a hotel near Lake Mburo N.P where you will rest. After brunch, you will drive back to Kampala or Entebbe (Airport) stopping at the equator for the requisite snapshot and a bit of souvenir shopping. Accommodation for tonight is not inclusive in the program. If you wish to depart tonight from Entebbe Airport, make sure your flight is at 10 pm or later. If you want us to book one (or more) nights in Kampala and/or Entebbe, please let us know. The extended Landcruiser is for some the ultimate safari vehicle in Africa. It’s 4wd, spacious, high up and strong. The extended land cruiser has even a coolerbox on board and an open roof for an excellent safari view. The extended landcruiser is suitable for a maximum of 7 persons.